My name is Dewey. I am a tiny droplet of water. Sometimes I look back at my life and can’t believe all that I have been through. I have been drunk by dinosaurs. I have brought millions of kids joy through the form of snow. I also keep flowers healthy and beautiful. This is all possible from a process called the water cycle. Right now, my home is a gigantic ocean called the Pacific. 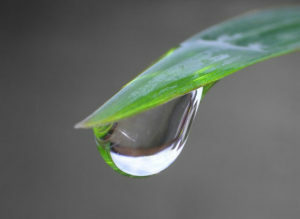 There are trillions of droplets of water that have moved from place to place as many countless times as me. Right now it is fall. The sunrays are not as hot as during the summer. In winter the fresh water will turn into ice. Fresh water is the only water that humans and animals can drink. I may spend winter here. Who doesn’t love a long beach vacation? I have learned this all from my many experiences. The sun is heating us up and giving us energy right now. I am changing into a gas. There are three forms of water: gas, liquid, and solid. Gas floats up, and I’m getting ready to fly up into the sky. This is a process called evaporation, which increases salinity, because I am now fresh water. When evaporation happens, we leave the salt behind. Here we go! Weeeee! We are flying up into the atmosphere now. The other droplets and I are cooling and condensing. We have turned into white puffy clouds, high up in the sky, watching the world below. This is a process called condensation. Next, precipitation happens. More and more water droplets make their way in here. Eventually there are too many of us for the cloud to contain. We precipitate down in the form of rain, falling from the sky as liquid. It is almost my turn. We can also come down as snow, sleet, or hail, which are all still forms of water. It is now my turn to fall. Weeeee! A few droplets nearby are landing onto a patch of red roses with a white gate surrounding them. But I have landed in a mud puddle! Yuck! I can tell that I’m in the backyard of a house. A little boy wearing a yellow raincoat and red rain boots runs and jumps into the mud puddle. He laughs and laughs. This makes me so happy. The sun comes out, and my cycle begins again.